Kansas City area employment surged in May to 1,008,300, a gain of almost 9,000 from April and 13,000 over last May. This marks the highest employment level we have seen in the metro since November 2008. Remember, we use seasonally adjusted data from the Current Employer Statistics, so this spike is not just from seasonal work. Industry-specific data — which is not seasonally adjusted, so the totals will not match exactly — shows where we are adding these jobs. (See our recent infographic.) The leisure and hospitality industry has experienced the most growth over the past year, followed by the professional, scientific and technical and administrative support industries. Decline in employment were seen in retail and government. 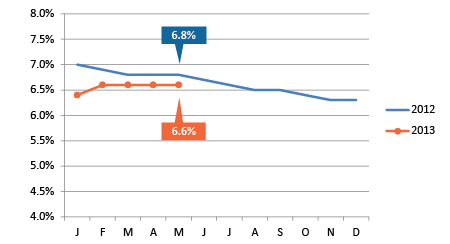 Our unemployment rate seems to be locked in at 6.6 percent, where we've been for four consecutive months. Hidden in this figure is another good sign. We have a significant increase in employment and the unemployment rate remains steady, which can only mean that more people are entering (or re-entering the workforce). In recent years we have seen the labor force decline as discouraged workers stopped looking for work. So, even though the unemployment rate is unmoved, there is still a lot to feel good about in this new data. The number of help wanted ads also appears to reflect employment growth. There were nearly 15,000 unique job postings in the Kansas City area in May. While this month’s employment spike is certainly welcome, it may appear to be an anomaly when we look back on it later in the year. It's unlikely we will continue to add almost 9,000 jobs a month on a consistent basis. But for a change, the data seems to describe a region that is regaining its economic health. The is good news indeed. 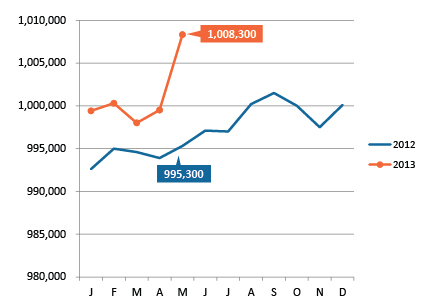 Local employment spiked in May, rising to 1,008,300. This marks the highest employment level for the region since November 2008. The seasonally adjusted unemployment rate held steady at 6.6 percent for the fourth month in a row. 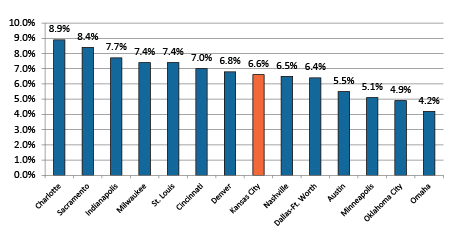 Kansas City's unemployment rate appears stuck at 6.6 percent, but we remain firmly in the middle of the pack compared to peer metros. 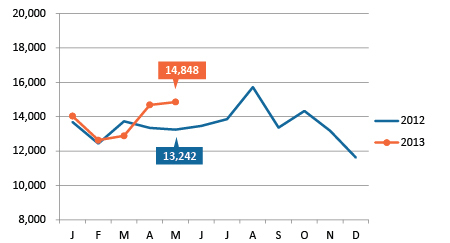 May job positngs sit at 14,848, well ahead of May 2012. 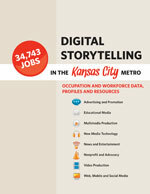 A new report published by MARC's KC Accelerator initiative provides data on digital storytelling jobs in Greater Kansas City. Digital Storytelling involves the use of computer, digital and web technologies to create narrative solutions that are enhanced by their creative use of media. There are 34,743 Digital Storytelling jobs in the Kansas City region today, and that total is expected to grow by 15.2 percent by 2022. The report also includes profiles of four people who work in this industry in Kansas City, and resources for training and education in the field. A new report from Economic Modeling Specialist International (EMSI), which says that 47 percent of our region's wage and salary employment growth between 2009 and 2013 has come from temporary employment. By comparison, EMSI estimates that 15 percent of all job growth nationwide has been from temporary positions. Only five large metros have higher shares of temporary employment over the period than Kansas City. So, what does it mean? Read the full post for more information.